Occupy Love, a documentary film by Velcrow Ripper kicked off its community release with over 100 cities worldwide showing the film in large theaters and small living rooms, even to 1500 people on the street in Porto Allegre, Brazil! We were part of the full, lively screenings at Upaya Zen Center in Santa Fe, NM, Unity of Taos, NM, and the Boulder premier. Each showing was full of wonderful questions and comments from the viewers and much enthusiasm for the film. Everywhere, the question was asked: How do we Occupy Love? Hosting a community screening is fun and easy! 1) Discover what ‘Occupy Love’ means to you and do it! This spring is being touted as Global Spring 2013 as we see love-in-action erupt worldwide on a variety of interconnected issues. In the film, activist Judy Rebick likens the Occupy movement, and all social movements, to waves upon the sand that rearrange the landscape of our world. Velcrow Ripper described Idle No More, Occupy Sandy, Strike Debt, InterOccupy, and the climate change movement as other waves of transformation. He said that the current global crises provide a great opportunity for social change, also referencing Joanna Macy’s ‘Work That Reconnects’ which describes three ways to participate in the Great Turning that we are a part of: holding actions such as protests, creating alternative systems (like local agriculture, currencies, and renewable energy grids), and work that shifts our belief structures to allow sustainable, just societies to emerge. Upaya Zen Center sends their love to all the other Occupy Love screenings around the world! In my own work as a novelist, one way I choose to Occupy Love is in the provocative and timely subjects that I write about. I am dedicated to reviving the social protest novel, using social media, crowd source funding, and community horizontal networking to get stories of our times into readers hands. The Occupy Love film was also created this way, celebrating the community screenings as part of a social movement that emphasizes the collective strength of many, rather than the patronage of the few. The ‘groundswell’ of enthusiasm for Occupy Love comes not from expensive advertisements, but from sincere responses from communities. Bravo! “Oh my, I think I have a case of Occupy Love, and want to share it with as many as possible,” said one viewer, Lauren Vines. Special thanks goes out to all the community members who spread the word, attended, and worked together to make each night of Occupy Love screenings successful, inspirational and insightful! I look forward to the second waves of community screenings that so many of you enthused about doing. Please invite me along with your friends, and let’s continue this beautiful conversation! Many thanks to Velcrow Ripper for joining us at our screenings. We are honored! 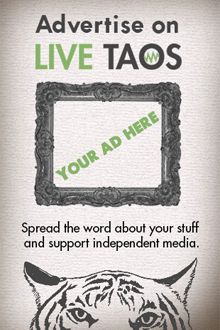 Rivera Sun is a guest author for Live Taos. Do you have something interesting to say? Submit your article to [email protected] and we'll take it from there.